**PLEASE NOTE: due to the lack of quality usable cores, we are not selling on an exchange basis, we are only offering to clean and surface / powder coat YOUR intake (you have to send us yours to be serviced). If your manifold has bad thread holes, is cracked or has corrosion near ANY of the water jackets, we will need to see it before we can give you an estimate on repair. When you are installing one of our engines, rebuilding yours on your own or just want to have a properly cleaned intake system, here you go. If you’ve ever looked inside of your plenum, you’ve seen how much carbon builds up on the inside your manifolds. Oil vapor from the PCV system, carbon from the EGR gasses flowing through and crusted on fuel spit-back all contribute to the ugly that is inside of yours. We have some options. Either way, the freeze plugs are removed from the manifolds, they are soaked in a tank for a few days then they are jet tank cleaned for 1+ hours and then glass bead blasted. Then they take a trip to our powder coater for color and clear. The manifolds are then machine surfaced at the cylinder head side, lower manifold to upper plenum, plenum to lower manifold and throttle body side. All threads are inspected and cleaned. *PLEASE NOTE: due to the popularity of these manifolds, long prep time and working with our powder coaters schedule, there can be up to a 3 week lead time. Feel free to call or email me here at the shop for an updated lead time on the manifolds. Tank dipped to remove carbon, glass bead blasted and rear plug replaced (also front EGR plug replaced for 1984-1988), threads are cleaned. 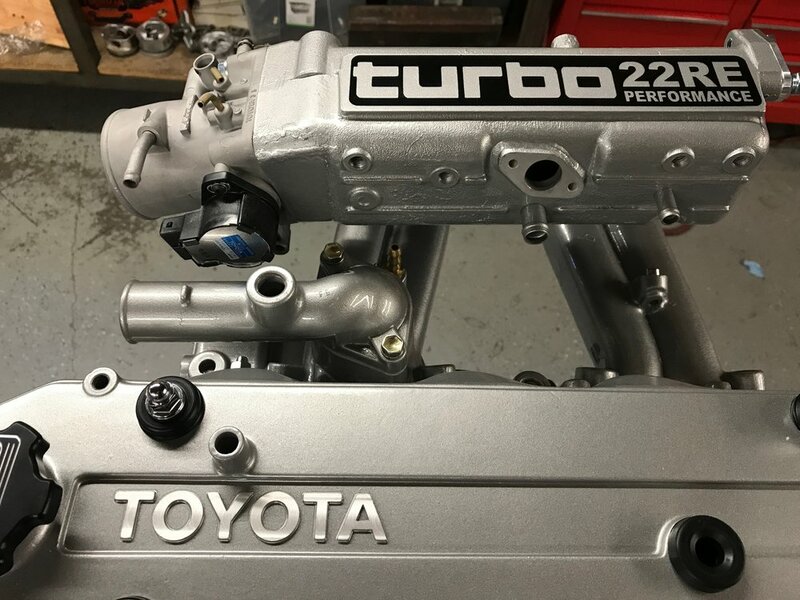 Manifolds are surfaced at cylinder head side, manifold to plenum side, upper plenum to manifold, thermostat housing surface and at throttle body surface. A spiffy silver vein / hammer tone silver/black color finished (and clear powder coated after) in the same color as our valve cover. A shiny silver color finished (and clear powder coated after). We did this color to match close to stock color without the oxidation that naturally occurs with uncoated aluminum. You weren't thinking of installing one of these bitchin manifolds using your janky, mismatched hardware.... were you?